George Gilman was a grocer by trade. He had a storefront on Commercial Street at the head of Customs House Wharf. 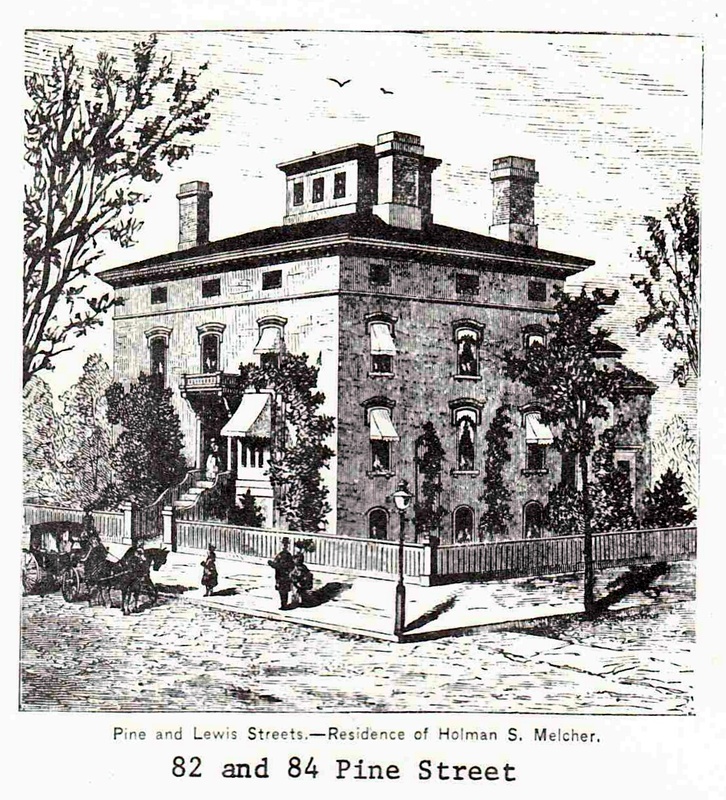 He and his wife Sarah had 2 children, Robie and Emma, when they purchased the lot at the corner of Pine and Lewis Streets from the Cushman family in 1862. They were living on Parris Street where the old Portland Public Works garage is located at that time. In time, George would join Amos King in forming King & Gilman Flour Merchants. The house George and Sarah built was a fairly straight forward Italianate. It is the left hand, larger, part of the current structure. It sits on a modest pedestal and is fairly squat in its proportions. Details were minimal with the first floor bays being squared and modestly adorned. The second floor windows have/had brick hoods above which runs a painted brick belt course. The brackets are very plain with simple scroll work. Holman Staples Melcher was born in Topsham in 1841. He attended local schools then Maine State Seminary, now Bates College, in Lewiston. In 1862, after completing his studies, he enlisted in the army. He was mustered in as a corporal in the famed 20th Maine Regiment. 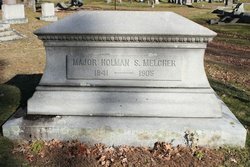 Melcher had a distinguished record in the 20th Maine taking part in all it’s battles and being named Adjutant in 1863. Among the battles was Gettysburg and the infamous ‘Little Round Top’. As a supertankers worth of ink has been spilled describing this event, I will spare the reader any details. Melcher would become, mostly posthumously, caught up in a minor dispute over who called for the infamous charge at Little Round Top, more on which can be found here. Holman married Alice E Hart in 1874. Melcher’s first wife, Ellen, died in 1872 at the age of 29. They had been married less than 4 years. Alice Esther Hart was the daughter of Henry Hart who, along with his brother Hanson, ran H.M. Hart Wool on Portland Street. Henry purchased 80 Pine Street from Hannah and Abraham Harris in 1869. The Harris’ are a mystery. They purchased the house from the Gilmans in May of 1868 and sold it, as noted, in October of 1869. On the purchase deed, they gave their place of residence as Cornish Maine. On the sale deed it was Portland. Abraham would buy and sell 2 more properties in Portland by Thanksgiving of 1870 when, on the final deed, he listed his place of residence as Chicago Illinois. Sarah Hart died in March of 1866. Henry Hart died in early 1871 at which time ownership of the Pine Street house was divided equally between their 3 children Sarah, Henry Jr and the aforementioned Alice. Sarah sold her interest to her siblings in the same year. Alice and Henry continued to live at 80 Pine Street up to the time of the marriage of Alice and Holman at which time Henry sold his share to Alice. Holman Melcher had partnered with George Churchill in founding Churchill and Melcher Wholesale in 1870. They were based on Commercial Street and dealt in a wide range of items. Melcher in time bought out Churchill and renamed the company HS Melcher Co. It was located at the corner of Market and Commercial streets in the space now occupied by LeRoux Kitchen. As the business grew and became successful, Melcher became involved in politics. In 1880 he was elected to the Common Council representing Ward 7 a position he held until 1883 when he was elected Alderman for the ward. He held that seat for one year. HS Melcher Letterhead. Wikipedia. This work has been identified as being free of known restrictions under copyright law, including all related and neighboring rights. Melcher’s fame and fortune would continue to rise. In 1889, he was elected mayor by the board of Alderman. He served 2 one year terms. His business would continue to increase into the 90s. In 1895, the Melchers hired the architect John Calvin Stevens make substantial changes to their house. The major part of the renovations involved the addition of a 24 x 24 bay to the west of the original structure. The addition remained mostly faithful to the original section in the massing, height, and window placement. Belt courses were retained as were the window treatments with their heavy, bracketed hoods. Other alterations and details seem odd or out-of-place. The entry, seen above, though well detailed seems forced. It overshadows the main entry which may have been the intent. The column on the right is not mirrored on the left. Instead we get an engaged pilaster decorated in the same manner like the one on the right of the portico. As it’s engaged to a wall that’s perpendicular to the street, we only see the end of it and this is not at a comfortable view for it. There is no pilaster at all on the left of the portico which only increases the imbalanced feel created by forcing the entry into the corner. Then we have the bay windows. The sketch from Elwell’s Portland and Vicinity shows a pair of square bays on the first floor with no other bays visible. As part of the 1895 remodel, a single square bay replaced the right hand window of the second floor. This bay is more detailed in its paneling than the bays of the first floor. There was no bay added on the left of the second floor to balance the right hand side. On the new section, a clipped corner or rounded bay was placed on the first floor thus adding to the overall imbalanced feel of the facade. Holman and Alice Melcher were active in Civil War Veterans organizations. They organized and attended reunions throughout the later years of their lives. By the later part of the 1890s, Holman’s wounds from the war started to have an increasingly negative effect on his life. He died in June of 1905 from Bright’s Disease. Alice lived at 82 Pine Street until her death in 1923. At that time, their daughter Georgina and her husband Harry Johnson, inherited the property. They had been living there since their marriage in 1906. Georgina and Harry continued to live in our subject until 1947 when they sold it to Vernon Hannaford. Hannaford divided the property in 1949 placing a dividing wall in the main block between the entry and the right hand bay. Here is an article at Maine Home and Design from 2009 on renovations performed by the current owners of 84 Pine Street.